So how is it that this proponent of simple living and small houses finds herself and her abode on a home tour? The flowers left by the property manager were a nice touch, but they stood stick-straight in a vase. I decided to pull them out and arrange them into something more decorative. The only problem? The house we were renting had no scissors with which to trim the stems. I was not yet so desperate as to use a knife, so I left them as they were. Soon, though, the lack of scissors would become a problem. I was on my semi-annual writing retreat. After writing over two hundred pages about my Camino last year, I had all but abandoned the project, overwhelmed by the prospect of turning it into something with structure and purpose that others might want to read. Wandering Malaprop’s a couple months ago, my eyes stopped on the book “Blueprint Your Bestseller.” I had no intention of writing a bestseller, but I was definitely curious when I saw the author would be speaking at the store next week. I skimmed the first few pages of the book. It was written for people who had a minimum of a hundred pages or so and didn’t know what to do next. I love when I come across books written just for me. So I bought it and dug in. Step 1: Make a list of every scene in your book without looking at your manuscript. Ha. This should be good. Steps 2 & 3: Highlight the “good” scenes on our list in green .. . Highlight the “bad” scenes on your list in pink. Okay. That was hard, but I did it. Step 4: Go back through your manuscript and identify your “forgotten” scenes. Ugh. Are you kidding me? I’ve got two hundred pages here! And every time I start looking through them, I want to hop a plane to Spain. So much for this idea. At some point, I read that you don’t really have a book until you print it out. So I determined I was going to face those two hundred pages–in the flesh. Which required me to buy some printer ink. And some paper. This was turning into quite a project. So as not to make it feel like burdensome homework, I bought purple paper–printing black on white brought back too many memories of college lab reports. Soon after printing I was able to answer the question, “What’s more intimidating than knowing you have two hundred pages to read through?” Seeing those two hundred pages in a huge pile on your coffee table. There they sat. I determined I would continue the steps in the book on my writing retreat. And here I am. Yesterday, I listed every darn scene (since I seem to have misplaced the first list I’d created months ago). I lost track of the number of times my mind wandered to thoughts of doing another Camino. Would I walk the route from Le Puy this time? Or from Oviedo? And I want to volunteer at a hostel while I’m there. Or should I volunteer at the Pilgrim office in St. Jean? If I walk in France first, I can get my French back up to speed so I can use it at the Pilgrim office . . . The next task, once I pulled myself away from thoughts of planes across the Atlantic, was to literally cut my manuscript into scenes. Oh. My. God. Seriously? Crap. Now I really needed scissors. Lois and I headed to Wal-mart. She wasn’t going to let a lack of office supplies stop me. 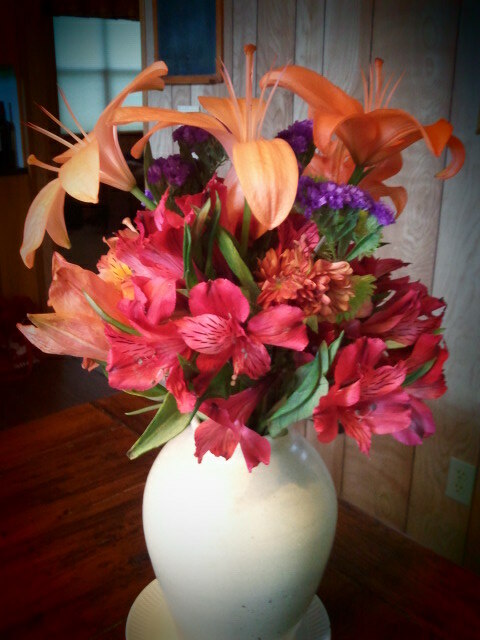 Upon our return, I did an excellent job of procrastinating and now have two lovely flower arrangements to show for it. So here is the state of my room. Purple pages cut into pieces, labeled with scene names. Part of me is eager to finish this step. Part of me doesn’t want to for fear what’s next! Before I left for the Camino, I’d read about the Cruz de Ferro: an iron cross that stood atop a pole that reached high into the air. Around its base pilgrims left stones they had either brought from home or picked up along the way. I read that the stone I carried was to be symbolic of my fears, worries, and expectations and that by leaving the stone at the base of the cross I was leaving those things behind. Walking Faster: Living Longer or Living Less? I heard about a study the other day that showed the speed people walk is related to the number of years they will live. Faster walkers live longer. If this is true, my father may live forever. He is the man who doesn’t take cabs when we visit New York City. Nor do we ride the subway. We walk. This is no take-your-time-see-the-sights walking; this is man-on-a-mission walking. I thought of him Saturday as I sped by the throngs of tourists on the streets of downtown Asheville, attempting to get to the Fine Arts Theater in time for a movie.